Furthermore, job growth within bitcoin enterprises has ultimately grown in regions like India. This is especially hopeful considering the country’s present stance on cryptocurrencies. Job growth in the virtual asset sector has grown by nearly 300 percent since November 2017, and searches on Indeed.com for India have risen by a whopping 52 percent. Regulators in India have repeatedly targeted cryptocurrency exchanges and commented that bitcoin and digital currencies are not “legal tender.” A task force has been officially developed to increase efforts against money laundering and other illicit activities, and new regulations could be implemented by late March. Still, approximately 10 percent of cryptocurrency transactions occur in India. Combined with present job searches and the overall growth in India’s bitcoin arena, there is evidence suggesting that a decline in bitcoin interest is not occurring on a global scale. What we’re probably witnessing is a “shift” in interest. It’s not that regard for cryptocurrency is on the decline; instead, interest may be adapting as people learn more, and universal intrigue is taking less of a general stance and gravitating more toward more specific terms and topics. 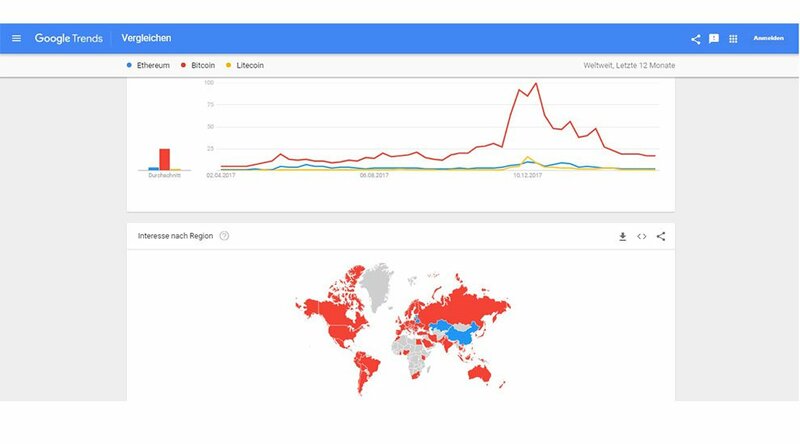 Bitcoin and Ripple searches, for example, remain prominent in countries like Ghana, Singapore and Austria. Terms like “ripple price” and “bitcoin bubble burst” dominate most of the cryptocurrency-related searches in these nations, while Bolivia and Australia-based searches suggest more interest in things like bitcoin cash. We are also witnessing a change in the types of investors behind cryptocurrency, who may ultimately be influencing search numbers. When bitcoin inched past $10,000 last year, the number of people interested in bitcoin grew to exponential levels. Platforms like Coinbase saw their userbases explode practically overnight, though it’s possible many of the people climbing aboard had little research under their belts. Uninterested in the long-term effects, it’s probable they merely saw crypto as a route to garner fast wealth. As the price of bitcoin waned in early 2018, several of these new investors, simply looking to strike it big, likely turned away when their hopes of becoming overnight millionaires were dashed. Thus, while interest and search volume would naturally decrease, it still appears some of these new traders may have been young people who have stayed surprisingly loyal to cryptocurrency. Many sources show that millennial interest in cryptocurrency has stayed strong to the point that several are even using educational funds to invest. Younger generations may be helping to prevent bitcoin and altcoin interest from falling away altogether. Analysts are also predicting that overall interest in crypto could spike again later this year. Many remain bullish on virtual assets, particularly bitcoin, and suggest it could reach new price highs by the summer of 2018. Fundstrat’s Thomas Lee, for instance, suggests that bitcoin might jump to $20,000 by July of this year. He says the behavior exhibited by bitcoin today is reminiscent of its behavior following an April–July 2013 sell-off, which was followed by what he calls a “monster rally.” He says if bitcoin continues its present track, $20,000 is a reasonable figure. Lee is not alone in his sentiment. Abra CEO Bill Barhydt says a new “price boom” is on its way in the coming months, and all “hell will break loose” once this occurs. He says that bitcoin and other forms of cryptocurrency are in for some huge jumps; hedge-fund managers and other wealth-driven individuals already see their volatility as potential opportunities and are swiftly adding them to their portfolios. Growing interest among the mega-rich could potentially cause prices to spike once again. Should that happen, it’s likely safe to say that general interest in cryptocurrency and bitcoin will surpass numbers witnessed in 2017.